Today, we finish up exterior painting and begin cabinet installation. EEKKK! 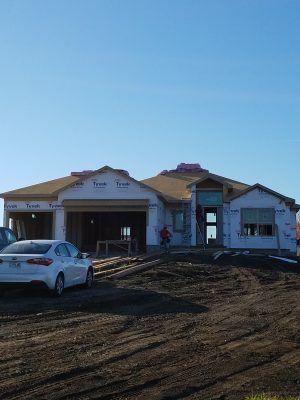 So exciting to see this home coming together! 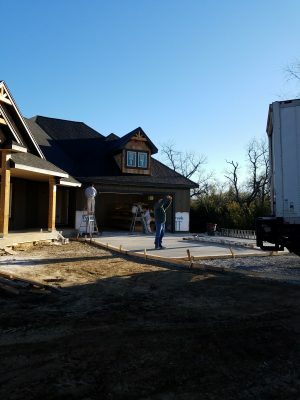 Next up for YOUR Custom Home Builder in the Kansas City Area: Greenwood, MO. 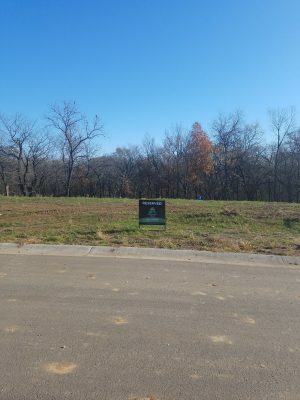 We currently have a few lots reserved for clients or for “spec homes” in the Woodland Trails Subdivision, including a model of the Jameson Floorplan… just click on the “plans” tab to view this awesome Story 1/2 plan! 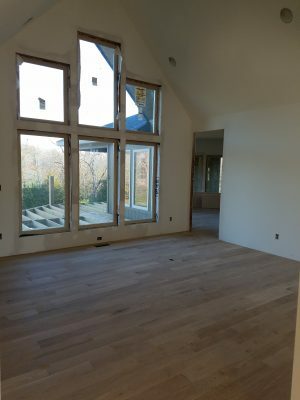 So very excited for these ‘first time’ Custom Home Build clients! They have such wonderful ideas and Stewart Builders is honored to have been chosen to make it a reality! 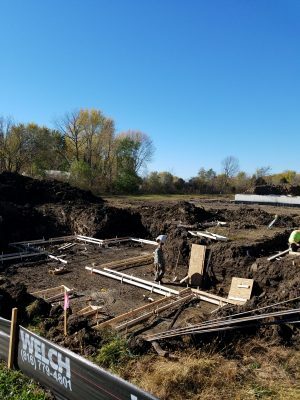 Footings are ready to be poured… Ready, Set, GOOOO! 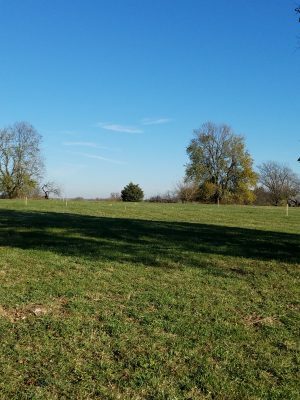 What a perfect setting for a custom built ranch! 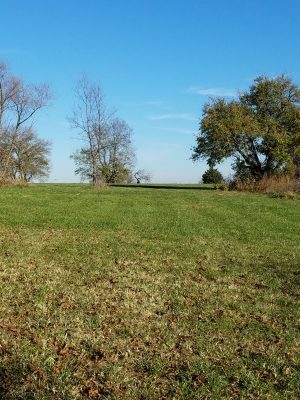 These clients will have the best of both worlds…quiet, beautiful setting just minutes from the Kansas City Area and all it has to offer. Lot is staked and ready for basement to be dug! 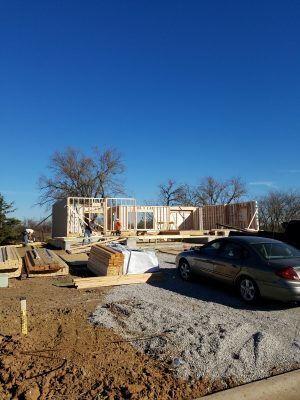 Framing is finishing up & roofers are ready to get started. This past Friday our clients completed the cabinet layout with Calton Cabinet, and plumbing layout with Tri County Plumbing. Today, we do our electrical walk through. Just another step to ensure our clients are getting exactly what they want! Never let building your dream home seem like an overwhelming task. 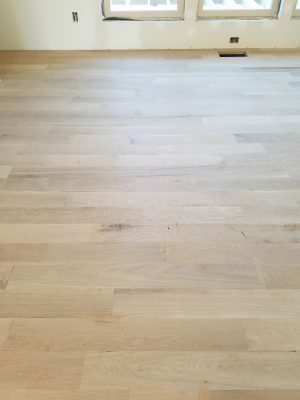 Stewart Builders LLC has you covered! 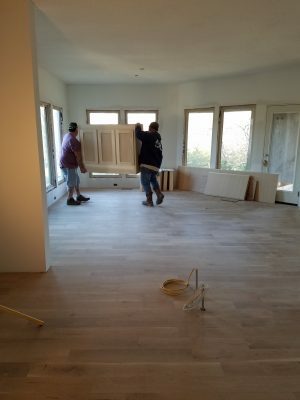 We have worked with our subs for many years & continue to make the custom home building process enjoyable & memorable for our clients. Contact us today, and let us be YOUR Custom Home Builder! Follow us on Facebook to keep up with our progress ~ CHEERS!